Improve your process times and reduce your energy consumption by upgrading to QADs technology. Improve your spraybooth lighting and reduce your energy consumption by upgrading to LED lighting. Energy prices, already at their highest level for years, are set to keep on rising for the foreseeable future. As a result, profit margins are under increasing pressure. Which is why more and more Bodyshops are looking at ways to reduce energy consumption and operating costs. AGM can offer you expert advice on spray booth spare parts or innovative equipment upgrades that can greatly improve the energy efficiency of your spraybooth oven, reduce cycle times and increase productivity, to give you a rapid return on your investment. Browse the range of spray booth spare parts. We also offer a FREE SURVEY of your bodyshop equipment in which we can offer expert advice on equipment upgrades that will improve energy efficiency and enhance your production process. LED lighting increases the LUX levels within the spraybooth using the same number of light fittings. AGM’s replacement lighting systems are designed to output between 1,000 LUX and 1,500 LUX depending on customers specific requirements. LED lights offer a cost saving of 60% when compared to equivalent fluorescent lighting. LED lighting also maintains consistent lighting levels which satisfy motor manufacturer approvals. Learn more about spraybooth lighting. QADs, developed by Junair Spraybooths is an advanced auxiliary air movement system proven to reduce energy costs by up to 40% and also reduce process times by 35%. The system works by accelerating air movement and supplying heated and filtered airflow from the corners of the spraybooth, the system also provides an even air temperature within the spray booth. QADs can be retro-fitted to any make or model of spray booth. 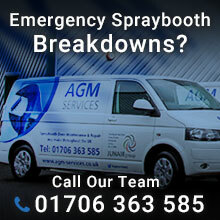 If you would like to book a visit from an AGM Services spray booth engineer then please contact us directly on 01706 363585 or alternatively complete the contact form featured on our contact us page.